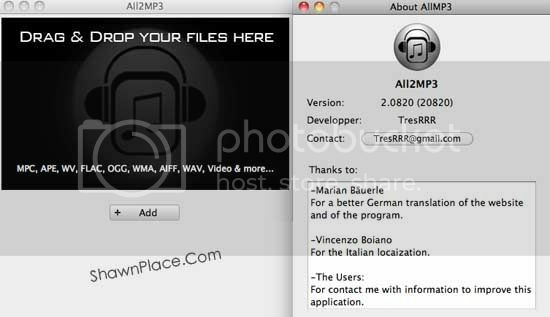 All2MP3 is a freeware for mac to help users to convert a wide variety of file formats into MP3s. Accordingly; the support file formats are APE, MPC, WMA, FLAC, WAV, and OGG. Therefore, do not assume that this application can convert every kind of format to MP3. In term of interface, users just need to drag-and-drop to the ALL2MP3 window. At the bottom part, an optional “Add” button for you to browse for files. Users can convert from WAVs and AIFFs, individually or in batches. Consequently, a progress status bar, giving user an options for quality (from “Less” to “Super”) and the capability to automatically trash files after conversion. By default, All2MP3 keeps the converted files into the source folder. Previous Post How to save screenshot of a Web Page as a thumbnail?